Classical Drive Now Live - Cars! Cars! Cars! Our dear old friend Philip Powell has taken to the web (again)—this time writing about old... uh, classic cars. And sometimes young women (which is really why we're mentioning it). Created for that vast number of enthusiasts who simply enjoy beautiful old autos and express their interest in a variety of ways, Classical Drive is an ever-changing cornucopia of "what's new" in the old car hobby. It includes auctions, automobilia, shows and concours, vintage racing, models, art and photography, museums, history... all the fun things that make the hobby so entertaining. I spoke with Phil and he said he's not going the restoration route—more the memory route. 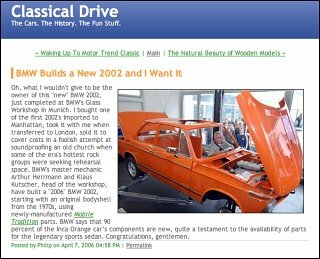 So if you are a fan of old cars, car memorabilia and car history in general, Classical Drive is the site for you. Despite this sounding like an ad, it's not. Phil is a close friend, but we don't plug our other friend's sites. This site stands on its own and we think you should look at it.